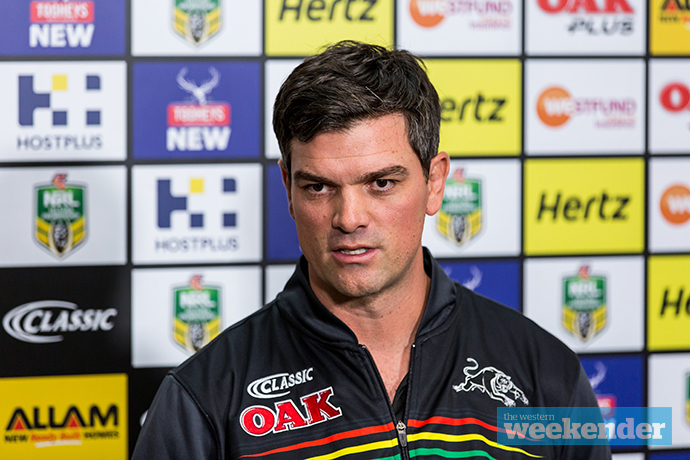 There is a growing feeling that caretaker Penrith coach Cameron Ciraldo does not want to remain in the position permanently. It’s my understanding the Panthers are also moving away from the idea of having Ciraldo warm the chair for Ivan Cleary should the Tigers coach confirm his return to the foot of the Mountains in 2021. That means that if the Cleary deal does not happen sooner, the Panthers need to find a short-term solution from elsewhere for the head coaching role. I’m told Wayne Bennett, Michael Maguire and Trent Barrett remain firmly off the list. Penrith officials are quietly hoping the Cleary deal may still happen in time for next season. Spotted: Panthers Chairman Dave O’Neill and Tigers coach Ivan Cleary in the same room together at a charity function in Penrith last Thursday night. The coincidence didn’t go unnoticed, and Penrith Mayor John Thain even suggested the pair get together for a photo in return for a donation to charity. It didn’t happen, but both took the suggestion in their stride. It should be noted that Ivan and his wife Bec have been long-time supporters of WestCare and certainly weren’t there as a guest of Mr O’Neill. 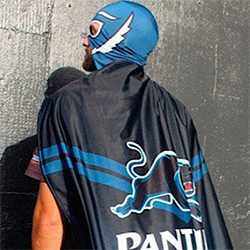 Talking of the WestCare function, Mr O’Neill made an extremely generous donation to the charity on behalf of Panthers at last Thursday’s event, confirming a $20,000 contribution to their ‘Buy a Night’ concept, which was helping to raise funds for WestCare’s crisis units that house women and families escaping domestic violence situations. Well done to all involved – I’m told you’ll read more about it in the Weekender in a few weeks. From Panther to politician? I’m told that a former Panthers premiership winning player is seriously considering a political tilt at the next Federal Election. Panthers enforcer James Fisher-Harris has been reading up on the club’s history. The 22-year-old was spotted at Panthers training last week with a copy of the club’s historical bible, Men in Black. 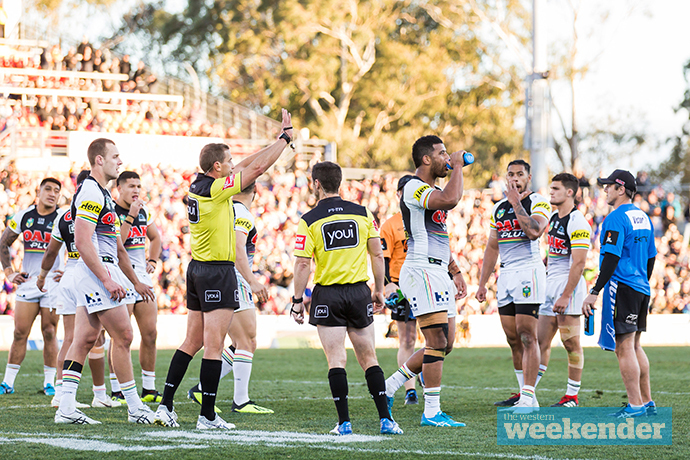 Three Penrith players copped fines as a result of that melee late in the game against the Knights last Saturday. Tyrone May, Waqa Blake and Viliame Kikau all copped $1,100 fines for their role in the fight, but no suspensions were handed down. Newcastle’s Shaun Kenny-Dowall and Danny Levi also copped fines as a result of the incident. An immigration issue almost caused Viliame Kikau to stay in Australia and miss Penrith’s clash with the Warriors on Friday night. Thankfully the issue was sorted out and the big fella will take his place in the side. Speculation was rife at Panthers Stadium last Saturday that Trent Merrin was playing his last home game for the club. Could he be bound for the Knights? Congratulations to Pantherette Kirsten Collins who was surprised by her partner Steven on-ground last Saturday afternoon with the ‘big question’. She said yes, and the couple will now begin planning their wedding. Incredibly it was the third surprise engagement at Panthers Stadium this season! Panthers five-eighth James Maloney has denied there’s any rift with halfback Nathan Cleary. “We’ve got a really good relationship,” Maloney told the Big Sports Breakfast. Maloney also denied rumours that the Gold Coast Titans had expressed interest in luring the 32-year-old to the glitter strip as early as next season. Well done to Corey Harawira-Naera who took time out of his match day preparation last Saturday to grant the wish of a loyal fan. Lily, who plays for the St Marys 12/3s, wants to be a Jillaroo one day and is a big fan of CHN. 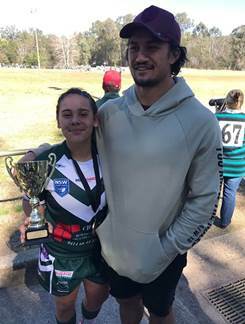 Her family reached out to the rampaging forward, who turned up to watch St Marys beat Doonside 22-18. Harawira-Naera cheered Lily on from the sideline and was more than happy to take photos with fans and sign autographs. Spotted: Injured Panthers fullback Dylan Edwards enjoying a meal with his beautiful young family at Cafe 2773 at Glenbrook.